On March 16th, Wise will be presenting oral arguments in the New York Supreme Court, Appellate Division, First Judicial Department in Manhattan on behalf of Tommy and Kiko, two chimpanzees who appeared in movies in the 1980s and are now living in New York State in questionable conditions—Tommy, in a concrete cell at the back of a trailer lot in upstate New York, and Kiko, in a concrete storefront operated out of a private home in Niagara Falls. According to NhRP, Tommy has frequently been left with a small TV set as his only stimulation; Kiko has been photographed with a makeshift leash made of a padlock and chain around his neck. Both animals, kept in cages, are being deprived the natural habitats and socialization that chimps, known to thrive in large and organized societies, require. Rather than attempt to sue or criminalize the chimps’ owners for cruelty, Wise is using a writ of habeus corpus to argue that these animals are being held against their rights as autonomous beings—autonomy being a “supreme common law value” recognized by the courts, as Wise explained. “Scientifically speaking, autonomous beings have the capacity to freely choose how to live their lives. They are not cabined by instinct,” Wise told Gizmodo. He believes Tommy and Kiko should be released to true sanctuaries, with living conditions more akin to the jungles chimpanzees are native to, and importantly, other chimpanzees to socialize with. While nonhuman entities like corporations have, in the past, been named persons in the eyes of the law, Wise is the first to seek personhood status for nonhuman animals in a U.S. court. And if it can happen once, the door will be open to recognizing personhood in other cases of animal cruelty. Wise could set a precedent that changes the way nonhuman animals are seen in the eyes of the law forever. Animal cruelty is usually fought piecemeal: Reports come out of an inhumane practice, an advocacy organization leads a reactionary campaign, and maybe a new law gets passed, or an offender is pressured to change their practices. David Coman-Hidy, executive director of The Humane League, says corporate boycotts are an effective tool. But it’s an imperfect system, because many forms of animal cruelty (like keeping chimps in isolation in concrete cages) are perfectly legal. Some laws are in place to protect nonhuman animals, but not nearly as many as you might think. Farm animals, the focus of THL’s work, “are afforded essentially no meaningful protections, legally,” Coman-Hidy said. Farm animals, though not (yet) the subject of NhRP’s work, make a strong case in point. Specific forms of cruelty remain legal until—maybe—they’re not anymore. Meanwhile, other forms of cruelty remain the status quo. Wise’s approach, of arguing that animals are being not just mistreated, but being held against their rights as autonomous beings, is meant to upend this usual order. It’s been a few years since Wise first made headlines for filing on behalf of Tommy in 2013, and initially being rejected by a ruling and an appeals court by the end of 2014. 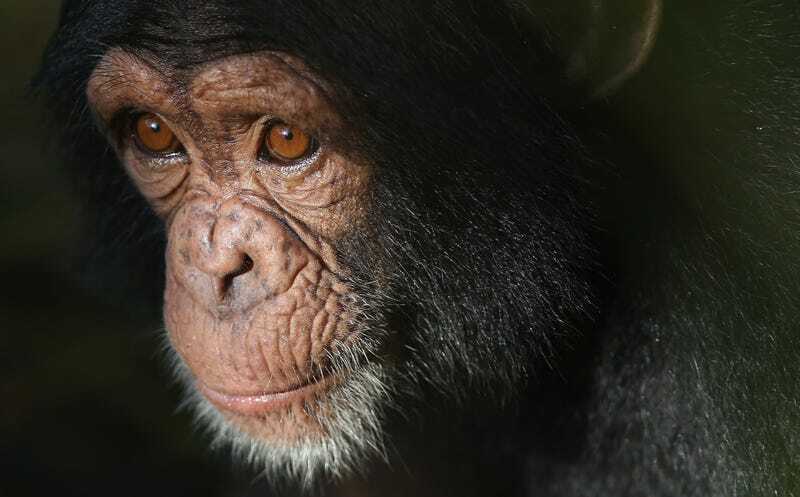 Since then, his firm has also filed cases on behalf of the chimps Hercules and Leo, who were being held at Stony Brook University as biological subjects for study. Wise didn’t win that case either, but a public campaign (led by none other than Jane Goodall, primate expert and NhRP board member) is now pressuring Hercules and Leo’s owner, the New Iberia Research Center, to surrender the animals to a sanctuary in Florida. Despite its losses, the NhRP is anything but discouraged. Wise is referring to what animal ethicists often call the “arguments from marginal cases”: if we define humanity, or personhood, as possessing a certain ability—in this case, the ability to assume responsibilities—what does that mean for the human beings who don’t? Are young children and those with disabilities less entitled to rights? Few would say so. And this is where it gets messy when scholars and judges try to make logical distinctions between humans and other animals. The particular distinction the Albany court went with in the case of Tommy was that collectively, humans are able to assume duties, and chimps are not. Wise is now armed to attack that assertion. The team has collected 60 pages of expert affidavits attesting to how chimpanzees in fact do assume responsibilities, both in chimpanzee-only and human-chimpanzee communities. At this stage, NhRP’s hope is the Manhattan court sets them up to appeal the Albany ruling. Considering it took almost 30 years between Wise getting the idea to argue for legal nonhuman personhood at all, and filing the first case, the process feels like a slow one. But Wise and his firm are in it for the long haul, and it’s entirely possible that one of their clients could be recognized as a person before the end of 2017. What’s more, NhRP is already looking outside of the Empire State. Wise sees the bigger picture as a movement. He says the firm is in talks with lawyers in 11 different countries. “We may be arguing in this courthouse way out in rural New York, but...people all over the world are paying attention to what we’re doing and why we’re doing it,” he said. As of now, NhRP is gearing up to file a personhood case on behalf of circus elephants, and it’s looking into building a case for the orcas at SeaWorld in San Diego. Though the nature of the abuse and mistreatment is secondary to Wise’s legal argument, these cases are likely dire ones—abuses against circus elephants and SeaWorld orcas are well-documented. Large animals in captivity often suffer illness and developmental issues as a result of cramped and unnatural living spaces and breeding practices. Even worse, reports of violent abuse (beatings, confinement, use of ropes and shocks) in performing animal conditions are tragically common. It would be no small victory for Wise to rescue even one of his clients from an unhappy life. But the greater value is the chance to set a precedent for the future. Future cases for nonhuman personhood in New York would be able to refer directly to the NhRP ruling, and a model would be provided for other states, even other nations. Kiko and Tommy, in other words, are only the beginning. Correction: An earlier version of this article erroneously stated that the New Iberia Research Center had been pressured to send the chimpanzees Hercules and Leo to a sanctuary in Florida. While the center is still being pressured, the chimpanzees have not yet been released. Gizmodo regrets the error.